Well in rough it would work. But you did not mention which camera. Also 50 meter SDI to the fiber converter on 12G. No way!! 30/40 meters MAX!! with the right cable and 12G capable connectors. But better hold it at 20 meters max Because even with good cable and connectors you loose so much on the cable that a Dropout is waiting to be happening. ** Got 3 years experience with 12G Sdi in a Broadcast environment running 12G trough fiber. All our cameras have the Fiber converter direct on the camera. Daniel has nailed this. 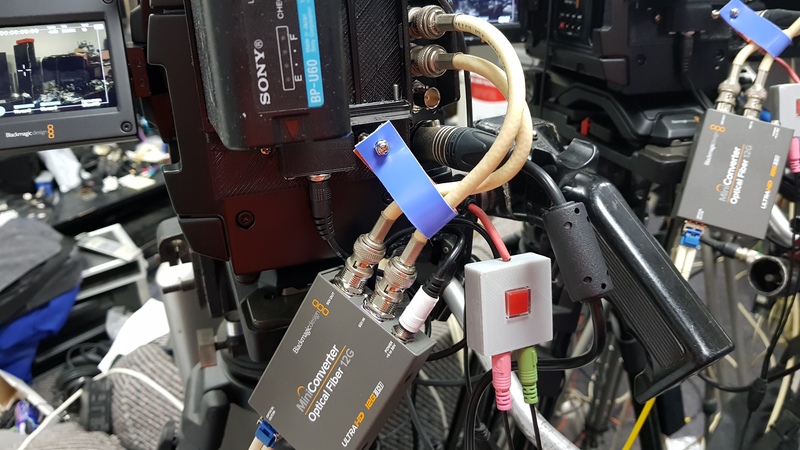 Choosing Broadcast type cameras like Ursa Broadcast offers the advantage of connecting the rover converter directly to the camera, eliminating long runs from camera to Converter, and one more set of connections to deal with. The camera then has the one fiber cable coming directly off it to thr control center with the switching connections close to the switcher. My experience in studios has taught me to keep camera/switcher connections as simple,as possible, and the fewer connections the better. Is the fibre optics durable? This is because the fibre optics cable seems like very easily to get broke. Xtreemtec wrote: Well in rough it would work. But you did not mention which camera. Also 50 meter SDI to the fiber converter on 12G. No way!! 30/40 meters MAX!! with the right cable and 12G capable connectors. Thanks for your suggestion, however, the Panasonic 4K video camcorder need to be portable so where can i plug the converter at the camcorder. If yes, does the converter consumer a lot of battery from the camcorder itself.